Bells ED133 Ten Bells on a transparent coloured handle. ..
Marracas - Bambina Green Frog ..
Marracas - Gourd Shell Mexican ..
Marracas - Heavy Duty Orange Plastic with Wooden Handles .. 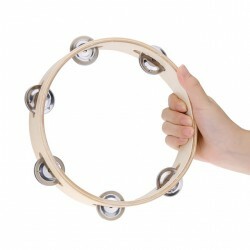 Rhythm Tech Tambino Childrens Tambourine 6 3/4" Junior Tabourine Enclosed ABS Casin..
TYCOON EGG SHAKERS Plastic egg shakers are excellent for recreational playing or drum circles..
Tycoon Mountable Wood Block (Large) ..
Tycoon Percussion Maracas Tycoon Percussion Maracas provide a driving pulse in the high frequency..